3.6 out of 5 based on 20 bloggers and 1 commenters. The slider in the template uses a 'Popular posts' gadget, you can edit some options like the number of posts that will be displayed. 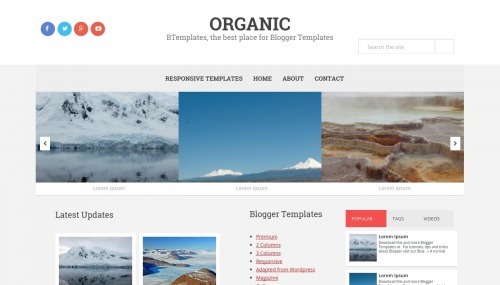 Organic is a free blogger template with 3 columns, responsive design, right sidebar, gallery-styled, minimalist, an exclusive design for Blogger, footer columns, slider, social bookmarking icons, posts thumbnails, tabs, breadcrumbs, pagination, related posts support, well designed threaded comments and neutral colors. Excellent template for blogs about any general topic, to use as a base to create your own design, news, photography or travel. – Any ideas how I can link the social buttons in the top left to my actual social accounts (facebook/twitter etc). I’ve tried to do this through blogger, however I can’t find the option anywhere. – secondly, the rolling photos across the top of the screen are taken from thumbnails of previous posts. Unfortunately the picture quality is distorted as they are zoomed in / stretched to fit the box. Any suggestions how I can avoid this issue or perhaps make the scrolling images slightly smaller? !